I never used to outline. For the longest time, I got by writing without outlines. Writing without them came naturally to me. When I started using them, I felt trapped, bogged down, and nothing like myself. My whole process felt constrained. I suffocated. In my writing workshops, I was taught not to write without outlines. My professors frowned or scowled when I shunned the thought of planning. “You can’t write like that,” they said. “You’re setting yourself up for failure.” Well, they were half-right. Outlining doesn’t work for me. For the longest time, I tried to fit in with other writers who swear by it, but the process felt forced. I was sure that everyone knew I was faking. My productivity ground to a halt. I put so much pressure on myself to do what everyone else was doing, instead of focusing on what worked for me. Since outlining wasn’t working, I must have been doing it wrong. I spent ages researching different outlining methods, trying to find out what might work for me. Heck, I even wrote some blog posts about my findings. None of it worked for me. I stalled out. I stopped writing. I plunged into the depths of despair and had a hard time getting back up. Then, I read a post by author Ksenia Anske. This post changed my life. Don’t outline. Ditch it. Just write. If you’ve never tried it, try. It’s an amazing discovery process. You will think thoughts you didn’t know you had. Don’t be afraid to discard them, to kill them, abandon them on the road. Wait for more thoughts to come. Wait for the right thoughts to come. Deep in your gut you will know them. Recognize them. Your problem is, it’s taking a while. At first. Because you’re a beginning writer. If you are, that is. Like me. It will speed up. With time. Make sure you allot yourself this time. Quiet time. Time when you’re not distracted, bored out of your mind. Get your mind still. Make it watch your thoughts. Get lost in them. Write. That was her bottom line, and like I said, it changed my life. Since reading that post, I ditched the outline and have never looked back. I tried outlining MUD EYES and got stuck (had to put it away). I tried it for half of BLOOD AND WATER, but I’ve learned my lesson. I’m moving on. It doesn’t matter how you write as long as it gets written. 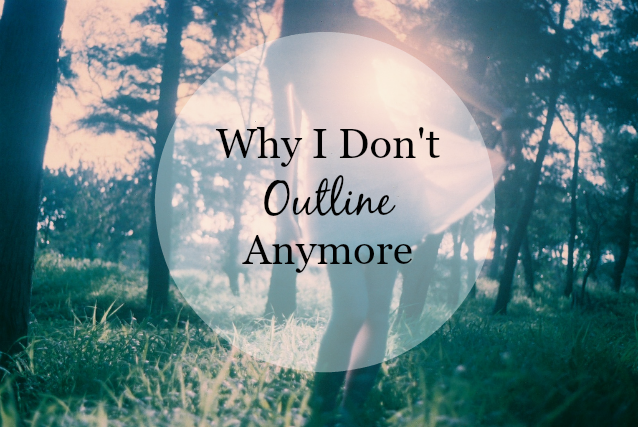 If outlining doesn’t work for you, throw the outline away. I won’t tell anyone, I promise. How do you feel about outlining? Are you a plotter, a pantser, or a hybrid of the two? With “Gods on the Mountain,” I had no outline. It was the first time I had done that. With previous projects, however, I’ve generally written a long synopsis, wrote down characters, etc. It was more for organization. If I got an idea, I permitted myself to stray from the outline as was necessary. So really, I never had that problem of feeling like my creativity was constricted somehow. You’re welcome! It’s not as as scary as it seems. 😉 Best of luck! Great post, Briana! Like you, I tried outlining many times and instead of it helping me write, it did the opposite. So I ditched it and my writing has never been better. Same here! Thanks for stopping by! To outline or not to outline. I battle with that every time I sit down to write. My last book I wrote without an outline, but this book–I kept getting snagged in places, so I wrote a VERY quick outline and almost instantly deviated from it. I haven’t decided what I’ll do for future books and even when I think I have, I change my mind. Great post! Thanks so much! When it comes to outlining or not outlining, there’s a lot to think about. I can’t agree more. To outline or not to outline, it really depends. But it shouldn’t stop you from writing your heart out. It’s the main spirit of writing. JUST DO IT!!!! I outline when I code. I make a list of all the things I need to do, in what order I need to do them, with sections and subsections, and then I execute, one item at a time, until I am done.This is part of the design process I place upon myself. It forces me to think of all the elements needed, some near, some far, and all required, that make a software project successful. This, however, gives a false sense of security that the project is underway. It’s not. The listing of the items is just a way to force me to think through all the options, to consider all the pitfalls. In a way, it allows me to be more comfortable with the project, to feel that I have outlined a roadmap of the path ahead. The KEY is that once the list is written, all that there is left to do is to execute: Go step by step, complete each item, cross it off the list, and move on to the next without thinking about the structure. If you start doubting the plan mid-way, the whole thing will fall apart. You have to just go through doggedly and just complete all the items, even if it makes no sense. Imagine you’re shooting a movie. The scenes are all shot in different orders than how they will show in the movie. Later, the editors put it together. To me, this would be the same with outlining. I’ve never done any writing projects where I oulined, but some of my writings have been thought of and rehashed in my mind, and the writing itself at that point, was just writing and embellishing the rehashed thoughts. In software, I would never start coding without first planning it carefully. In creative writing, I much prefer the vibrancy and spontaneity of pantsing, and I think the reader can tell the difference. If I get stuck, sometimes I’ll do a couple of bullet points about where I THINK the story is going to go, but I don’t end up sticking to them. I guess that’s kind of like outlining? Agree.. my current story I have been trying to write with an outline. Even my mother (retired English Professor) pushes outlining. But man, it’s… hard. Not writing the outline, but I totally get that sense on being constrained by it. The first story I really wrote.. I just sat down and wrote. Just wrote. Some days only 300-500 words, other days more. One day over 6000 words, it just flowed. I’m finding it much much harder to even WANT to write with the outline, because I know already the total flow of the story. I’m going to try to finish the story this way, but I think this will be the end of the outline for me. Definitely not! Also, if you decide you want a little more structure, check out TAKE YOUR PANTS OFF by Libby Hawker. I’m reading it now, and it’s fantastic! Just bought this – now to find the time to read it! Read a little before bed every night – that’s one of my favorite ways to make time for reading!